© Copyright 'INDIAN0' all rights reserved. Organizer: RACIPA (Ray of Ancient Contemporary & Indian Performing Art). 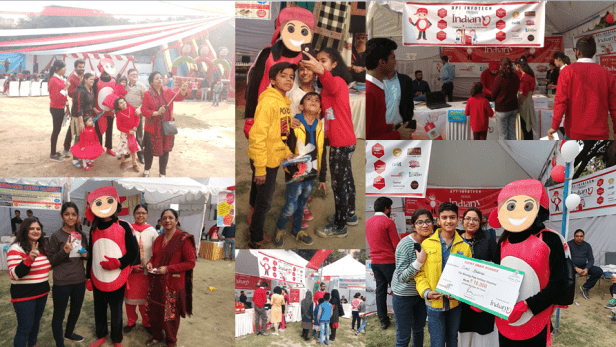 RACIPA Team who used to conduct various events, talent hunt, corporate events, stage shows, inbound tours and more organized 3rd Annual Winter Carnival "AFLATOON" at Sarita Vihar, Delhi on 24th Dec, 2017. The renown annual winter carnival was back again with lots of fun and activities specially for kids of Age Group 4 to 12 or above. The event was just a day before "CHRISTMAS EVE". Interested Games for kids and parents. Every game was associated with lots of goodies and gifts to the winners. (1 month free subscription of Indian0 for winners). Know-how about Indian0 AI module for Kids age between 4 to 12 years. Multiple main stage presentation regarding products and sponsors. Selfie with Mr. ZERO (Indian0 Mascot) - We have introduced Mr. 0 at the event.